This email is intended to make sure that I have been sending the right information in my previous emails to you. The information, if right, should be helping you in making right decisions for your new home. However, I would like to speak to you directly and ask about your priorities. If you find it feasible do give me a call at the number attached: [phone number]. Moreover, if you would like to continue the dealing via email then I would suggest you reach me at my private email address: [email address]. 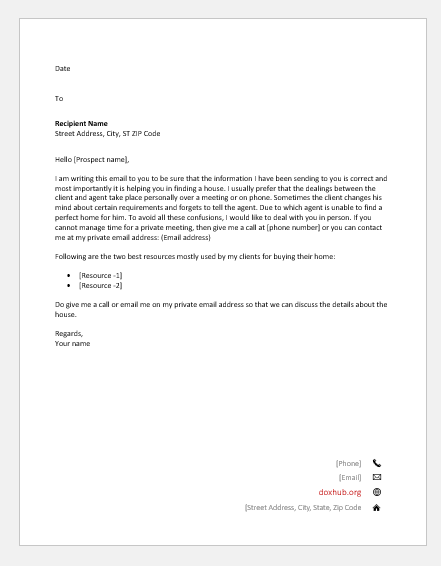 Kindly give me a call to reach me after receiving this email so that I can continue finding your dream home. 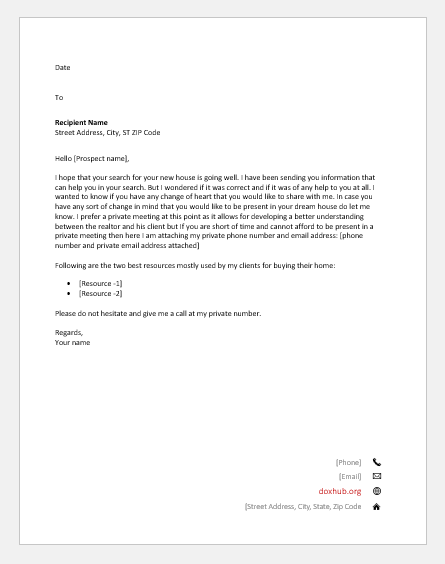 Do give me a call or email me on my private email address so that we can discuss the details about the house. Hope you are doing fine. I am writing you this email because I wanted to make sure that the information I have been sending you is helping you in finding a dream house for yourself. As I got no reply of my previous emails from your side I wondered if you have changed your mind about what type of house you want. If you still want a house with the same requirements or you have changed your mind about some of them do let me know. Kindly give me a call at the phone number attached or email me at my private email address: [phone number and private email address attached]. Please do not hesitate and give me a call at my private number.